As a leading supplier of Single Point Mooring systems, Offspring International has an unrivalled knowledge of offshore terminal loading and offloading. Since installing its first Conventional Buoy Mooring (CBM) over 15 years ago, OIL has systematically developed its product range to include submarine hoses, and state-of-the-art telemetry and monitoring systems. Conventional Buoy / Multi Buoy Mooring is the ideal mooring system where there are limited quay facilities, infrequent loading / offloading operations, and as an alternative to single point mooring. It comprises multiple buoys to moor the tanker securely and prevent weathervaning. A submarine hose attached to the terminal’s PLEM (Pipeline End Manifold) is recovered from the seabed and connected to the midship manifold to begin loading / offloading operations. 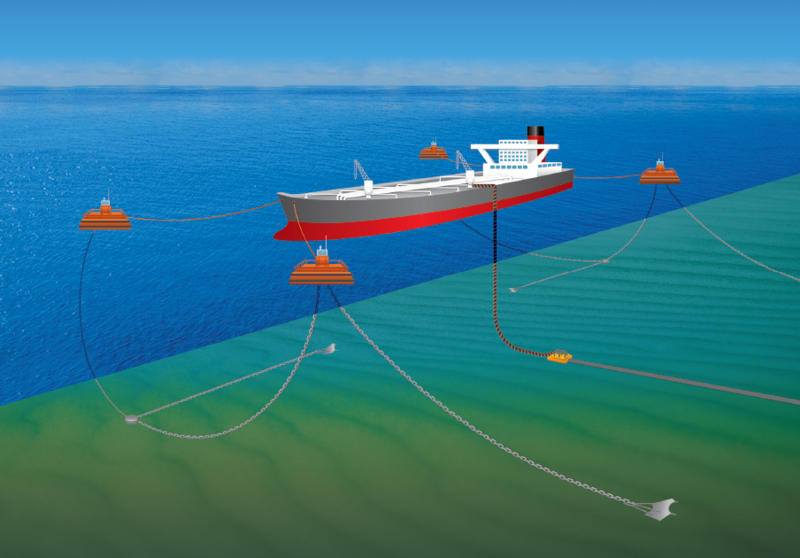 The CBM mooring system comprises typically four steel mooring buoys. The exact configuration will depend on water depth, field requirements and environmental conditions. Each buoy is moored to the seabed with a single pendant chain to the bottom of the buoy. A secondary anchor is also included to prevent the primary anchor from being dislodged by adverse weather conditions. Each buoy has a chain hawser assembly through the centre of the buoy unit, terminating in a chainstopper on the tanker deck. It also includes a quick release hook fitted with a sensor to indicate whether it is locked or open; this is monitored by the telemetry system. Each CBM buoy is fitted with a power system, navigation aid, hook release system, instrumentation / telemetry, tanker equipment and shore equipment. Power for the equipment on the buoys is provided from solar-powered batteries to provide autonomous 24 hour operation, and with sufficient capacity for multiple hook operations and prolonged periods of poor weather. The buoys feature 10 nautical mile LED navigation light, and a radar reflector to enhance the ‘visibility’ of the buoy to nearby shipping. In addition, each buoy is fitted with a GPS receiver to provide accurate telemetry timing; as well as buoy positioning.